During 2009, I worked in the Botanic Gardens of Adelaide headquarters – the Goodman Building, on Hackney Road in Adelaide. There I conducted a legal review of legislation protecting South Australia’s conservation and biodiversity. I loved every moment of that role. Having returned to studies in environmental planning and management, it was the type of role I was hoping to engage in. I was in heaven. I didn’t miss the being near the city’s Rundle Mall shops for a moment. Every lunch hour I would race outside armed with my camera and explore every corner of the Botanic Gardens. I took a photo of a Nymphaea Lillie in a small pond on the eastern side of the gardens. For my printmaking class at the time, I prepared a monoprint based on the image. My teacher, artist, Christine McCarthy, taught me how to do a monoprint in the way she was taught at art school. This was the first time I’d used oil paints. I fell in love with them right away; I loved the way they were firm and stuck to my brush. I found oil paint magnificent. Although I still love prints and printmaking, I am now an oil painter. Since this time, I always wanted to do an oil painting of the nymphaea lillie. So now I have done this, see below. The original painting is 24 x 30″ or 60.5 x 76 cm. 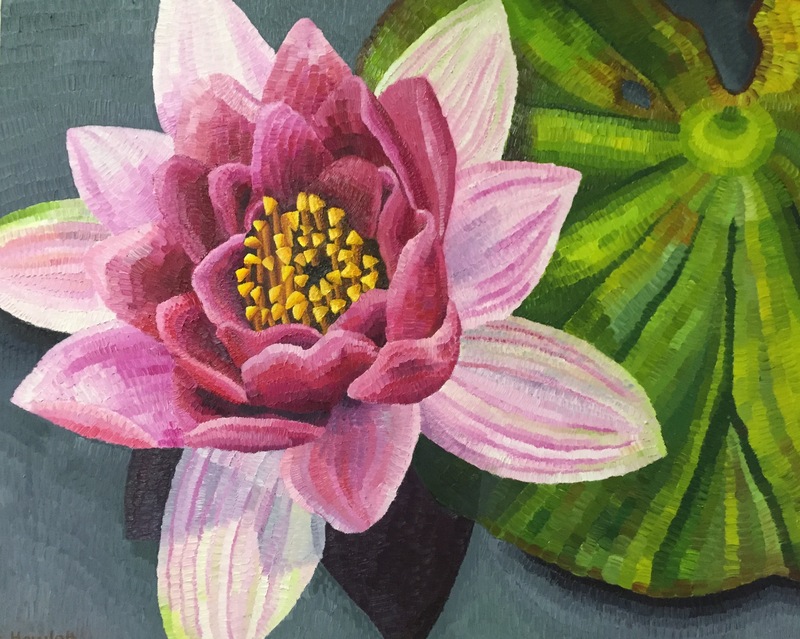 Nymphaea in the Gardens, oil on canvas, Elisabeth Howlett, 2015. 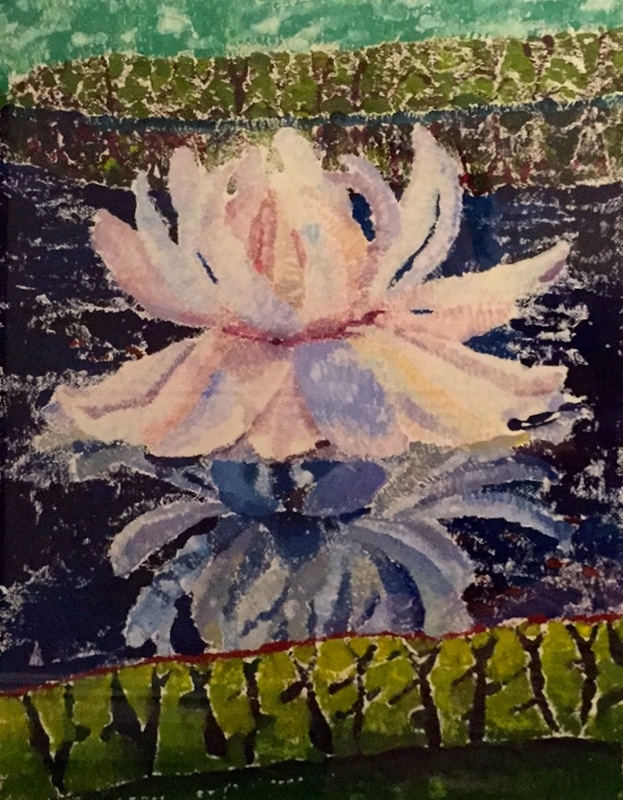 The other monoprint in that printmaking exhibition was of the Victoria Amazonia, the giant waterlily. The giant waterlily is enclosed in the Amazon Waterlily Pavilion within the Botanic Gardens. Before the pavillion was constructed, The Director of the Botanic Gardens, Stephen Forbes travelled on a symbolic journey to South America, specifically to collect the seeds of the Victoria Amazonia. It is a magnificent flower. I was lucky enough to capture it as it was opening. 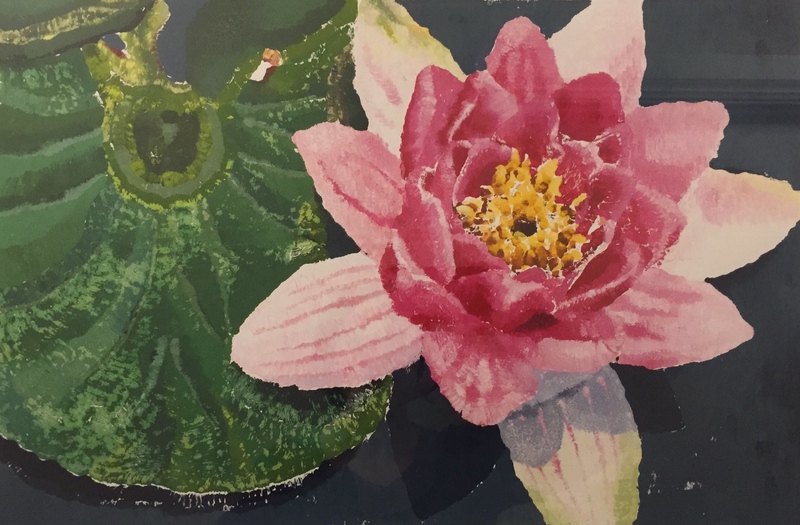 Both of the above waterlily prints were exhibited in a group exhibition with my printmaking class at Ruth Tuck Art School. This was my first ever art exhibition. 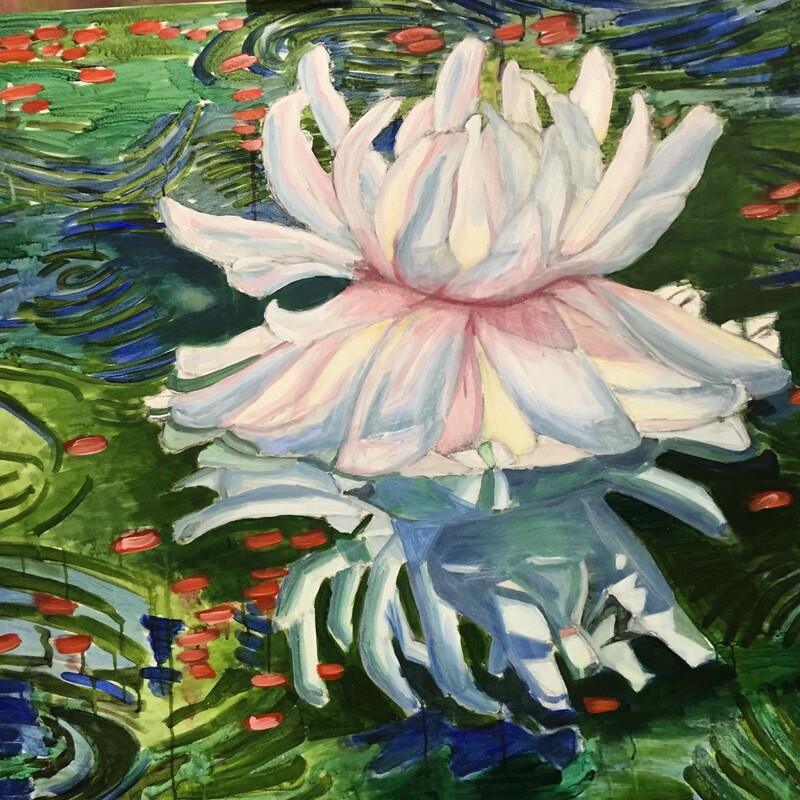 I am preparing a large painting of the Giant Waterlily at the moment; I have just completed the underpainting, which I do as a watered down layer of acrylic paint. This seals the canvas and provides a ‘map’ for the painting. I like to make a lot of decisions at this early stage, so that when I paint in oil, I can just paint! Next Next post: What is a giclee print?